Renewable energy technologies have had numerous triumphs in the urban landscape scene - not only for environmental and branding purposes, but rather for offering genuinely practical solutions. Gone are the days where cost savings and payback for solar-powered systems were not attractive. Today, architects, urban designers, outdoor street furniture and green energy companies incorporate alternative energy sources into their products to generate savings, achieve efficiency and build awareness branding dedicated to clean environment and preservation of our planet. In this context, urban design applications need to take a step forward to improve the outlook of our society’s future. This shift includes the introduction of urban design concepts adapted to climate change in order to raise the environmental standards globally. Solar energy is one of the technologies that can help improve a lot of aspects in our urban design. It is a proven technological concept with practical energy efficiency implications. Innovators are slowly paving the way to a solar urban landscape that defies traditional energy methods. Increasing independence from the electrical grid has also helped protect communities from volatile energy prices and power outages. Designing energy efficient homes based on green energy sources is increasing rapidly, and believe me it is the way ahead to clean energy future. Read more on green building energy applications in this article. This blog outlines several important innovations that are getting a foothold on urban design projects due to their appealing, futuristic and above all increasingly practical nature. Read on about the most popular solar urban design applications (also to get more info on this topic follow Lightinus on Facebook and Twitter). Standard Solar (photovoltaic) PV rooftop systems are already found all over the globe. They’re popular for commercial and industrial purposes, but they’re popping up all over residential spaces as well. The residential rooftop space is really hard to ignore because of the sheer volume of energy and business that could be generated with this solar system. Each individual customer may seem like a small solar energy generator, but think about the sum of such solar systems if installed on a large scale in villages, subdivisions and urban massive roof spaces. The scale at which solar system installed on rooftops can grow and help these individual homeowners is quite promising. Check out some additional info on how solar panels, which are the basis for solar rooftop applications, actually work in practice here. Building-integrated photovoltaics (BIPV) are also taking centerstage due to its large potential. Glass imbued with solar PV properties effectively turn large glass facades into solar panels. These inventions are doubling the efforts to make hybrid green facilities a reality. In 2016, Elon Musk of the tech powerhouse Tesla unveiled his design for solar shingles - a double purpose invention that covers the aesthetic and practical needs of homes. Soon, the tech powerhouse will deliver full plans for their solar urban landscape strategy! This is a simple change to help your urban home design concepts towards the clean and efficient energy future. Solar street lights, incorporating solar controller, solar panels and a special energy storage solution such as solar battery, have been instrumental in many public and private outdoor lighting projects. Large rural streets with constrained access to main grids helped far-flung areas attain efficient lighting. Creating extensive electricity networks for long stretches of street lanes can be very difficult for remote areas in terms of spacing and budget. This problem can be easily addressed with smart solar led street lighting technology, helping civilians avoid accidents and making streets visible at night. Solar street lights are urban design examples that are being widely used worldwide. Read more on how solar street lighting complements green building design standards here. Not only can these smart solar street lights generate electricity, but they are also programmed to save costs (decrease manintenance, servicing, installation and human resource costs). The solar LED street lamp expends the energy when most needed and conserves the energy by dimming the brightness when it does not detect motion in the area. This application is not only cost-effective, but it is also a champion for safety. To learn more on how smart can solar street lights become, click here. There is a common misconception that solar PV systems generate energy from heat, but in reality the solar panels actually utilize light. However, one popular usage for solar energy technology is an application for thermal water systems within a facility. Utilizing a sizable area in your facility to provide a solar heating machine is a good move that will help lower the energy consumption related to such activities. Whether the need for heating or cooling is at a constant load or not, a solar installation can help you address these needs. Urban design examples of this technology use either rooftop or ground-mounted solar installations for this purpose. Depending on the urgency and amount of heated water a facility needs, there is a proportionate reasonable amount of space created. One of the most difficult issues to address in urban planning is the local pollution in the area. Mitigation is an important part of the process, but we need to equip spaces with easier ways for people to clean up and make a difference. Leaving trash out on the street has become normal thing to do in some cities, even when the streets are lined up with several types of trash bins. Worse still, is when people cannot seem to follow segregation instructions which make waste management operations even more difficult. Another issue that comes up is the difficulty of collecting waste in a mixed-up form and the volume of trash that is being handled from day to day. It seems like a never-ending problem. 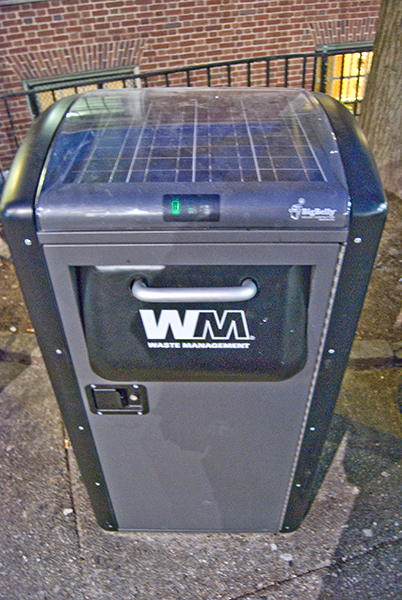 Enter the invention of self-contained solar-powered trash cans with the ability to compress its contents. The energy produced by its solar system enables it to mechanically compact the trash inside the box, effectively using the space within to hold more trash than usual. This space-saving technology encourages smarter waste disposal and more hygienic, attractive environments. Today’s solar installations are advanced enough to guarantee energy production as long as there is sun. When local governments invest in these innovations, they can effectively provide free energy to the community. Solar charging stations are urban design solutions that can address not only citizens who need to charge their gadgets on low battery, but include Wi-Fi capabilities and remote communication systems. If you would like to find out more about the features of solar charging stations, you should check out the following webpage. Enabling an urban community with innovative solar solutions can help get rid of day-to-day inconveniences and allow citizens to live a more productive and environmentally friendly life. Solar charging stations can also generate revenue by utilizing LED screens, powered by solar energy, for advertising purposes. Solar urban design has huge potential to become an effective marketing tool. In a society largely dependent on electricity, we continuously have to be pushed to think outside of the box for urban design solutions. Solar power has given us a window of opportunity. Backed with data analytics and energy storage solutions, the options for urban design concepts seem limitless. The possibilities and constraints are what we will be able to work with, but this forward thinking makes it a more exciting process. Going green is no longer a face-value power move that just seeks recognition from environmentalists. Choosing solar urban design is a real, practical choice that will change the face of urban design projects. Learning more about these technologies is not so difficult. Such solar systems are supported by remote monitoring services that will give you full control of your solar design applications. The future of your project is in your hands!